Cleo Hartwig's classic body of work includes sculpture in stone, wood, terra cotta, plaster, and ceramic. She belongs to the tradition of direct carvers (taille direct) who carved straight into their materials, without the use of intermediary steps. With this approach, the artist's conception and execution is influenced by the density, veining, color, and shape of the material. 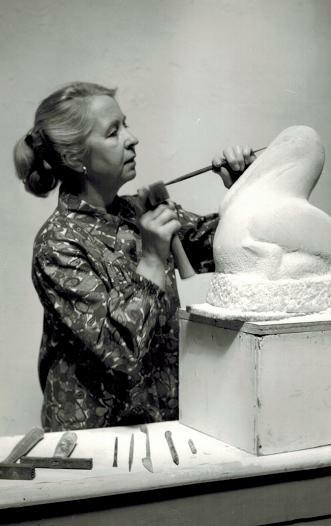 Hartwig is part of a distinguished line of 20th century direct carvers, including artists such as Jose de Creeft, whom she studied with, and Vincent Glinsky, her late husband. Cleo Hartwig was born in Webberville, Michigan on October 20, 1907. As a young girl, she led nature tours of plant and animal life. Her devotion to the natural world was to become a seminal force in her art, influencing her subject matter and shaping her style. Hartwig spent two summers studying at the Chicago Institute of Art, before graduating with an A.B. from Western Michigan University in Kalamazoo. She then traveled widely, spending summers studying art in Europe (Poland, Hungary, Rumania, Germany, and France) and Mexico. Her Mexican travels and her study of the Spanish language had a strong impact on her figurative work. Settling in New York City in 1936, Hartwig began to exhibit yearly with the National Association of Women Artists, the New York Society of Women Artists, Sculptors Guild, National Sculpture Society, New York Society of Ceramic Artists, and Audubon Artists. She taught art at The Town School, The Lenox School, and Ecole Francaise, and resided in the picturesque Greenwich Village mews, Patchin Place, historic home to many of the famous artists, poets, and writers of the 20th century. During World War II Hartwig did drafting work for Bell Telephone Laboratories (1942-45) and technical illustrating for the Jordanoff Aviation Corp (1943-45). 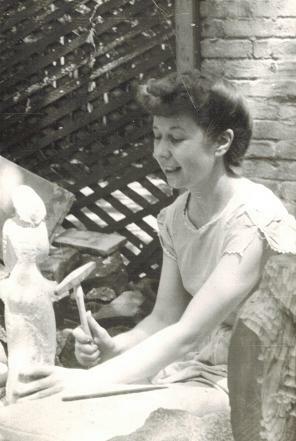 During those years she also had her first solo show at the Clay Club in New York. The show brought together her talents as a sculptor, a naturalist, and a ceramist. It included 29 works, ranging from abstract and figurative pieces to her beloved nature forms, including animals (frog, mouse, hen), insects (flea, louse, moth), and even a glazed terra cotta bird bath. In 1945 Hartwig won the National Association of Women Artists' Anna Hyatt Huntington Prize. That same year she also became a sculpture instructor at Cooper Union in New York and the Montclair Art Museum in New Jersey. In addition, she completed an important work for the architect Kenneth B. Norton: a "Family Group" for the Continental Casualties Building on Williams St. in downtown Manhattan. For that commission Hartwig created an 8-foot-high bas-relief of a mother, father, and child, which was cast in aluminum and installed over the entranceway to the building. By 1947 Hartwig was ready to present a second solo show. This exhibit featured an impressive set of 27 works, again including her signature mix of animal and figurative pieces. By then her works were owned by the Newark Museum, Detroit Institute of Arts, and private collections, and had been shown at such venues as the Pennsylvania Academy of the Fine Arts, Denver Art Museum, Chicago Art Institute, Nebraska Art Association, and National Academy. 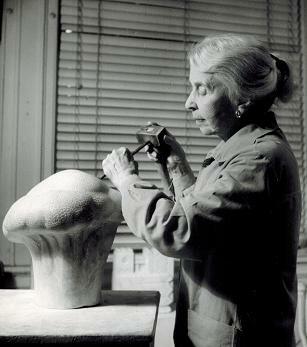 In 1951 Cleo Hartwig married the Russian sculptor, Vincent Glinsky. Their son, Albert Glinsky, was born the following year. The uniquely compatible husband-wife partnership of Hartwig and Glinsky was documented by Enid Bell in a feature article published in American Artists magazine. The 1960s saw Hartwig exhibiting in unique venues such as the 1964 New York World's Fair and outdoor shows at Bryant Park in midtown Manhattan. Reproductions of her works were offered for sale by Sculpture Collectors, Collectors Guild, and Alva Museum Replicas, which also commissioned her to create new works for reproduction. Throughout the 1970s and 1980s she continued to exhibit regularly in group shows, in addition to solo exhibitions at the Montclair Art Museum, Harmon-Meek Gallery (FL), the Sculpture Center, and SUNY Plattsburgh. working on "Nesting Pelican" (Tennessee Marble). *Sculptors Guild: Exec. Director (1976); Exec. Board Member, Exec. Vice-Pres.